Our latest demonstration featured Keith Morton painting "Still Life with Apple" in Acrylics and was enjoyed by over 50 members who appreciated his informative and entertaining session. Keith works with Winsor acrylic paper, uses a stay-wet pallet, with a limited range of colours. His warm colours are Cadmium Yellow, Cadmium Red, Ultramarine and his cool colours are Lemon Yellow, Alizarin Crimson, Prussian Blue, and White applied with a 1cm flat brush. 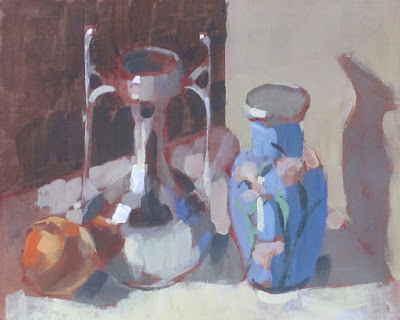 A background wash of diluted Burnt Umber had been prepared and Keith started with a careful assessment of the subject and sketched a layout drawing in Alizarin. He does not mix or blend paint on the paper and generally uses all three colours to mix each tonal shade on his pallet and then applies to the painting. Warm colours are used for the main subject, and cool colours for shade and background to slowly build the image. Within the two-hour session Keith made it clear he would not finish the painting and explained he would normally take 2-3 days to complete a painting of this nature. We thank Keith for his work with us.